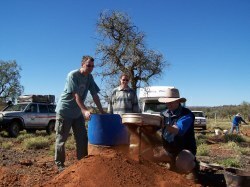 Experience the thrill of fossicking for your own beautiful Central Australian gemstones. Tours include all equipment, experienced guides to help find the gems and an appraisal of your gems on your return. On-site gemcutting service from Apr-Sept and a stunning range of jewellery in which your gems can be mounted. Come out and stay for a day or two in our bush caravan park. Bookings essential. Powered and unpowered sites are scattered amongst the mulgas – all the required facilities without being ‘jammed in’. For an additional cost, Gemtree has easy-to-assemble two-man tents for hire with airbeds. Air-conditioned cabins offer a level of comfort to ensure your Gemtree experience will be enjoyed by all. Cabins have a self-contained kitchen and are close to amenities for showers and toilets. There is also an airconditioned on-site van available. Please remember BOOKINGS ARE ESSENTIAL.